*Maimi picked the leaders of each unit rather than naming members individually. Tsugunaga was used for Country Girls, which does not officially have a leader. The relationship graph would have been a mess, so I didn't bother doing it. However, if we just focus on mutual picks, we get something that's digestible. 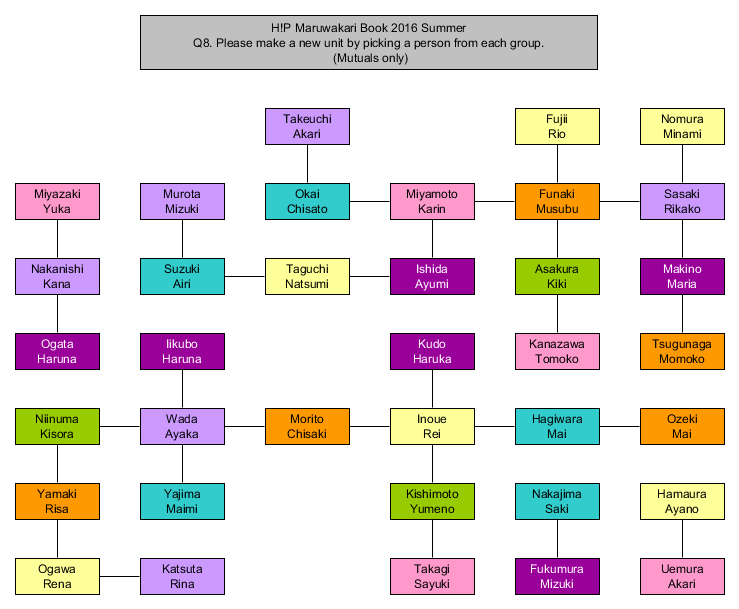 4 mutuals seems to be the most, with Funakki, ReiRei, and Ayacho managing to hit that many members. Rikako and Karin-chan have three mutuals. 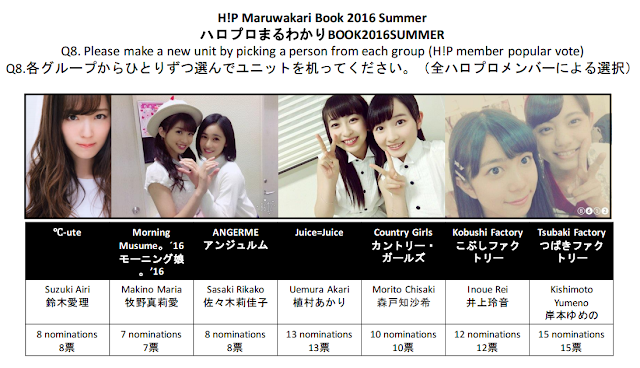 Morning Musume。´16's Sato Masaki-chan: Simply said, it seems like fun! ANGERME's Sasaki Rikako-chan: We've got the same image colour, and since we're high energy, it seems like it'd be fun! Juice=Juice's Kanazawa Tomoko-chan: We're the same age, but Kanazawa-chan and I have completely different atmospheres, so it seems like it'd be fun. Kobushi Factory's Inoue Rei-chan: Since she's cute. I'd like to do something as ReiRei, MaiMai. Tsubaki Factory's Tanimoto Ami-chan: When I was together in a unit with her at the Hello! Project concerts the other day, I had a lot of fun, so I'd like to team up with her again! ℃-ute's Okai Chisato-san/ ANGERME's Kamikokuryo Moe-chan / Juice=Juice's Miyamoto Karin-chan / Country Girls' Funaki Musubu-chan / Kobushi Factory's Taguchi Natsumi-chan / Tsubaki Factory's Asakura Kiki-chan. A gathering of the shortest members in each group! Since we've unexpectedly never done such a unit. ℃-ute's Suzuki Airi-san/ ANGERME's Nakanishi Kana-san / Juice=Juice's Miyazaki Yuka-san / Country Girls' Inaba Manaka-chan / Kobushi Factory's Fujii Rio-chan / Tsubaki Factory's Tanimoto Ami-chan. I always make jokes and puns since that's what I like, so I chose members who seem like they wouldn't stop laughing at my jokes and puns. ℃-ute's Yajima Maimi-san / Morning Musume。´16's Iikubo Haruna-chan / Juice=Juice's Miyamoto Karin-chan / Country Girls' Morito Chisaki-chan / Kobushi Factory's Nomura Minami-chan / Tsubaki Factory's Niinuma Kisora-chan. Yajima-san's friendly with me, and Harunan and Karin are members whom I'm close to!! I've heard that Chii-chan likes S/mileage, and she likes me (laughs) MinaMina! Kisora-chan since I hear a lot about her from AiAi (Aikawa Maho)!!! ℃-ute's Okai Chisato-san / Morning Musume。´16's Makino Maria-chan / Juice=Juice Takagi Sayuki-san / Country Girls' Funaki Musubu-chan / Kobushi Factory's Nomura Minami-chan / Tsubaki Factory's Asakura Kiki-chan! I picked people whom I think don't heed the senpai-kouhai relationships in their groups! By the way, for Tsubaki Factory, it's the 'M' from Tanimoto AMi!! ℃-ute's Hagiwara Mai-san / Morning Musume。´16's Haga Akane-chan / ANGERME's Sasaki Rikako-chan / Juice=Juice's Uemura Akari-san / Kobushi Factory's Inoue Rei-chan / Tsubaki Factory's Asakura Kiki-chan. ℃-ute's Suzuki Airi-san: She's good at singing and dancing, and there's a lot that I'd like to learn from her! ANGERME's Wada Ayaka-san: I'd like to watch Wada-san to figure out how to look mature! Obviously Miyamoto Karin-san from Juice=Juice! I'd like to perform together with Miyamoto-san whom I love - she's my goal! ℃-ute's Yajima Maimi-san: With Hello! Project's oldest and youngest members, I think it'd be an interesting group! Morning Musume。´16's Sato Masaki-san: I love Sato-san's performances, so I'd like to learn from her up-close! Kobushi Factory's Fujii Rio-chan: Since we're good friends, and since she dances so nicely, I'd like to do some sharp dancing! Tsubaki Factory's Asakura Kiki-chan: Since I never want to lose out to her whenever I dance next to her! ℃-ute's Okai Chisato-san / Morning Musume。´16's Ishida Ayumi-san / ANGERME's Kamikokuryo Moe-chan / Juice=Juice's Miyamoto Karin-chan / Country Girls' Funaki Musubu-chan / Tsubaki Factory's Asakura Kiki-chan. ℃-ute's Suzuki Airi-san / Morning Musume。´16's Ishida Ayumi-san / ANGERME's Murota Mizuki-chan / Juice=Juice's Kanazawa Tomoko-san / Country Girls' Morito Chisaki-chan / Tsubaki Factory's Yamagishi Riko-chan. The tallest members in each group. I'm the tallest in Kobushi Factory, so I'd like to perform together with the tallest members of each group!! ℃-ute's Hagiwara Mai-san / Morning Musume。´16's Kudo Haruka-san / ANGERME's Sasaki Rikako-san / Juice=Juice's Uemura Akari-san / Country Girls' Morito Chisaki-chan / Tsubaki Factory's Kishimoto Yumeno-san. It seems like fun to be together, and if it's in our private time, then I'd like to take a walk and have a meal ♥ I'm good friends with Chisaki-chan, so I'd like to go to to the amusement park or for a movie. I think I'd be really nervous to be with Hagiwara-san, but I think we'd become friends by being together. The overall winners seem like some sort of photobook-based unit.